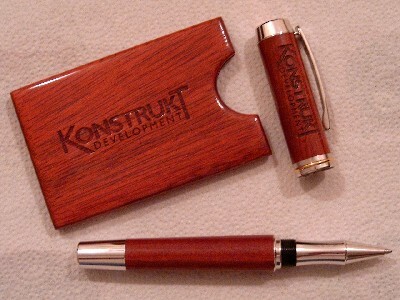 Corporate logos can be engraved on pen boxes, business card holders, and desk sets. For logos on pens or pencils, please contact us prior to ordering. When purchasing engraving, please specify the text to be engraved. Please contact us at questions@executiveaccessories.com for more information on our engraving service. Please allow two additional weeks for engraving services. 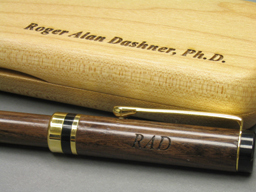 This is an example of a Classic American Pencil made from Bolivian Rosewood and a Maple case laser engraved with name and initials. 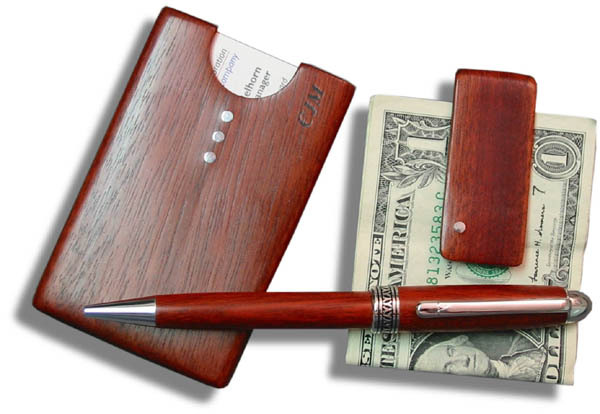 This is an example of a Pocket Business Card Holder and a Gentlemen's Platinum Pen made from Bloodwood laser engraved with a company logo.